When Kurt and I traveled to Nashville in August 2014, I was seven months pregnant. We knew we were having a boy but hadn’t really purchased anything “general specific” for him. While wandering through Franklin, TN, we discovered this really cute store full of quirky and hand-made items. 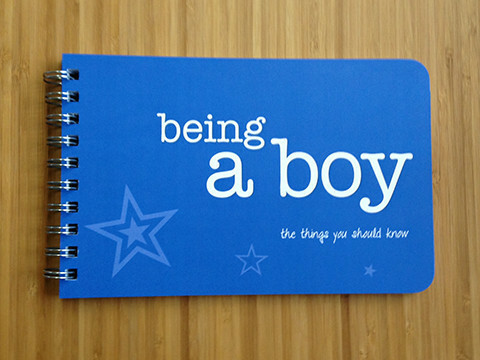 There was a small kids section so while we were browsing through the picture frames, toys, puzzles, and books; Kurt pulled out this flip book called “Being A Boy: The Things You Should Know”. I wasn’t really sure what to expect but after reading through a few pages, we knew this was something we really wanted to share with Nate. Basically, it’s a book about life and all the life lessons we want to instill in Nate. Today while I was cleaning up his room before bed, I saw he’d pulled it out of his book shelf. I began flipping through the pages and decided I wanted to share a few of my favourite “lessons” from this book. These are things I truly believe in and it’s a way to remind myself how I want to raise my son. You are an incredible boy. Don’t let anyone tell you otherwise. “Please” be polite. “Thank you”. “Being a man” doesn’t mean being tough. There are too many images on TV, and people you’ll see in person, showing that boys and men need to be tough, act cool, be aggressive. Real men are simple, nice, caring. AND ABOVE ALL ELSE, they don’t worry about what “tough guys” think of them. Don’t do things just to fit in. Take a stand for what is right. A lot of times your friends just need someone else to be brave first. Tell your mom that you love her. Every time you see her. Don’t change the way you look to compete with others. If your clothes are different. If your hair is different. If you’ve got freckles, dark skin, or light. You are unique. You look like you, and that’s what makes you stand out to everyone who loves you and cares for you. Don’t hit or talk badly about people. There’s not a single time in your life when that will help. You have to take a bath or shower- like it or not. No matter how much of a pain it seems like sometimes, you have to. Everybody starts to smell and look dirty, including you, and other people WILL think it’s gross if you don’t keep yourself clean. Respect girls and women, no matter what. Treat girls the way you want your Dad or others to treat your mom. And as long as you’re at it, respect other boys and men too. People deserve more respect than we often give them. Be honest. Lying always gets you into more trouble. No one is perfect. As long as you do your best, you did it right. Have an “I don’t do dares” policy. People who dare you to do things aren’t concerned with whether or not the dare is good or bad for you to do. They want you to do something for their entertainment. Read whenever you get the chance. You’re going to want to have lots and lots of knowledge when you get older, and reading when you’re young is the best way to get that. Friends can be mean sometimes. Learn to forgive them. Try new foods. There is SO MUCH good stuff out there, from all sorts of cultures. Your parents will always be there if you need to talk. Always. Everyone has something to share if you let them. Include everybody. Make them feel special, just like you want to feel. Shake hands when you meet a grown up. Look them in the eyes and speak clearly. They will be impressed. And you’re going to want this skill all your life. If your father is around, tell him you love him every time you can. He will mean everything to you for all of your life. There isn’t anything that you could do to make your parents stop loving you. Even when they’re really upset. When someone tells you that you are exceptional, say thank you. Don’t roll your eyes, or say “no I’m not.” You are. If you don’t get it right, try again and again. Don’t get too discouraged. Giving up is the only way to fail. If it makes you feel uncomfortable, something is wrong. Stop. If it’s lying, cheating, putting yourself in danger, hurting others. Be nice to your sister or brother. She or he will ALWAYS be there for you. Even more when you’re older. Challenge yourself with something. You will be happier and stronger all of your life if you challenge yourself to get better at things. The internet is amazing. It is not always truthful. Try to think before you speak. Our first reactions are often very emotional. And even if we’re right, we want to find the nicest and most productive way to speak to others. Stick up for people when needed. If they’re nice and need your help, or if they’re doing the right thing and others don’t appreciate it. Homework isn’t supposed to be easy. The hard work makes you smarter, stronger, and will bring you more success. Brush and floss your teeth. You will go to the dentist WAY LESS OFTEN if you do. Fighting in the movies is NOTHING like in real life. People can get hurt really badly from little things. They can’t be thrown through glass windows, and can’t be hit on the head. Be proud of how you look and what you are wearing. You look good, and don’t have to look like everyone else all of the time. Be grateful for what you have. You have more right now than many will have in their entire lives. If you’re not sure of something, it’s okay to ask. You don’t have to guess. No one expects you to know everything. You may not like your parents all of the time. They may drive you crazy. That’s okay. They love you. You love them. Walk away from fights any time you can. They don’t end up like you see on TV and don’t lead to anything good. There’s always an alternative. Have the goal of going through your entire life without getting into a physical fight. Don’t just let things bug you. You’ll feel almost instantly better when you get things out. Write stories, write songs, or draw. These are really good ways to get things out that are bugging you, and share your feelings…even if it’s a drawing just for yourself. Your clothes are not a napkin or towel! Let’s try to remember this please. Don’t let friends pressure you into doing things. If you don’t want to do it, don’t. Say “I’m sorry” when you need to. All of us make mistakes every day. Saying sorry fixes those mistakes MUCH faster. Get up early. You can get so much done in the morning. You’ve then got the afternoon and evening for activities, sports, playing, goofing off, friends, family, TV. It can be fun to “act like a man” but don’t be too tough or cool. The world has too many tough guys, and not enough who will be calm, patient, understanding, and truly caring. Bullying is not an option. Never bully anyone. Stop friends who bully someone. NO ONE deserves it, or should have to deal with it. And if you’re being bullied, don’t be embarrassed at all to tell your parents or another adult. They’ll want to know, want to help you, and it’ll make your life much easier. Learn to cook. It’s one-on-one time with Mom or Dad. You’ll make pizzas, burgers, and desserts. And you’ll know how to make you favourite foods. Play sports or be active in any way. You DO NOT have to be great at sports. Different people are good at different things. Sports are just one way to stay healthy. If it’s not sports, make it playing at the park or riding your bike. Do things to get you out of the house, and keep you healthy. Previous Post NHL Here Nate Comes!